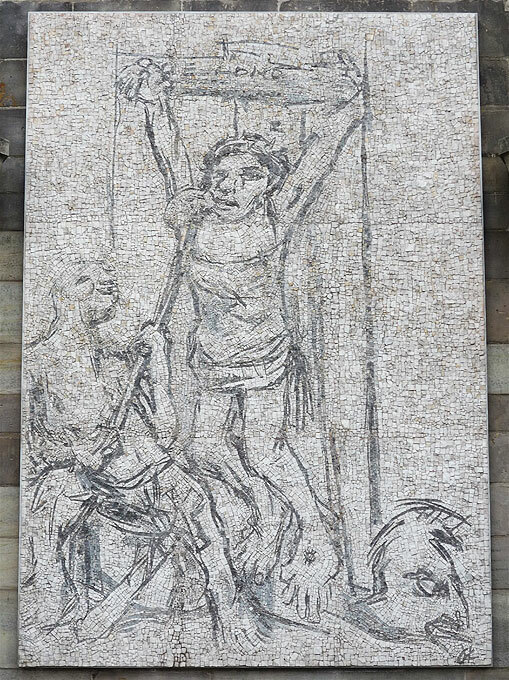 Expressionist painter Oskar Kokoschka (1886 - 1980) designed this picture of Christ on the cross with a soldier passing him the sponge soaked in vinegar; the soldier’s expression is not full of hatred, but indifferent and apathetic. The artist called this picture Ecce Homo – ‘Behold the Man’, appealing to our humaneness and compassion. a picture in black and white mounted in the choir of the Memorial. a coloured mosaic mounted above the main altar of the new Hauptkirche St. Nikolai at the Klosterstern. Its title is Ecce Homines – ‘Behold the people’, so indifferent on the one hand, so defencelessly suffering on the other. These works link the old and the new site of the parish of St. Nikolai. The “Prospectus” installation makes the figurative sculptures in the St. Nikolai Memorial visible in two ways of presentation. shows five figurative motifs that are printed on both sides on weather resistant mesh that is made taut behind the window above the main portal, up to 34 m high. It resembles a film strip that is taken out of a film spool or tin. When facing the Hopfenmarkt, the visitors see the motif while on the lift. The mesh structure overlaps the view of the cityscape. Depending on the lightning situation in the outer area, either the motif or the background appears dominant; the view is a perspective through the picture, or a view of the picture itself. is located inside the tower and represents in exchange different opposing pairs of pictures of the figurative sculptures at the tower that usually are out of the visitors’ sight. From the outside, the picture stele is radiant and emphasizes the original main entrance of the church. This sculpture is dedicated to the memorial in Sandbostel where in one of the largest prisoner camps established by the Nazis more than 50,000 people from many countries had died until 1945. 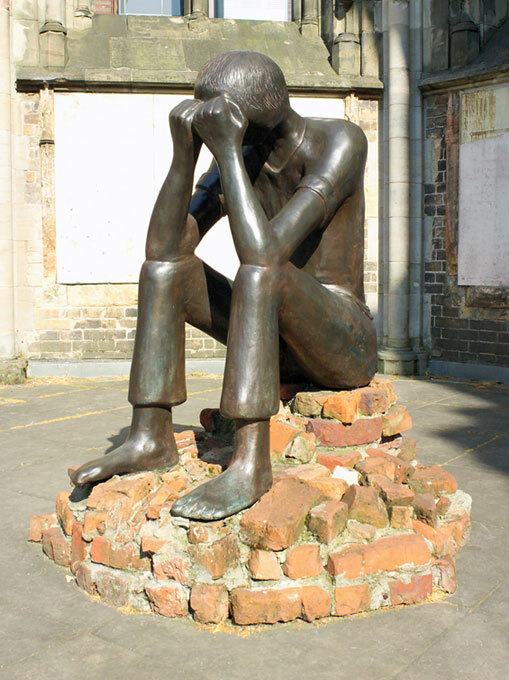 The base of this sculpture consists of the original bricks of the prisoners’ barracks which Sandbostel pupils had collected on the former camp grounds. The title ‘The Ordeal’ reflects the way in which affected individuals coped with this extreme situation and also invites the beholder to deal with it. ‘No man in the whole world can change the truth. One can only look for the truth, find it and serve it. With this sculpture the artist wants to show that all strength and all knowledge reside within man himself. If he finds the way back to himself, he will recognise this core and find his peace which is prerequisite for a community spirit and peacefulness among people. The artist presents the sculpture’s title in eight languages to offer guidance to international visitors. This sculpture intends with meditative strength to build a bridge from the terrifying events of the past for which the Memorial stands to a future full of hope which is possible only in times of peace. The visitor is invited to become part of this process. 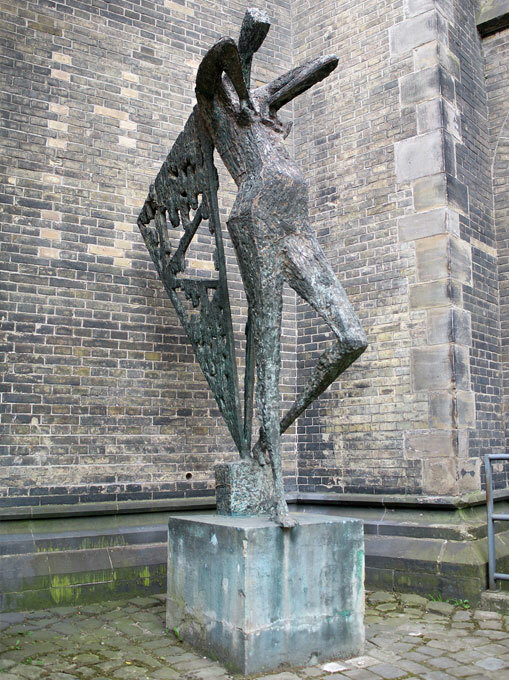 In June 2017, the sculpture was taken over from the Breckwoldt Foundation and brought to Lauenburg, the hometown of the artist, who had died in 2013. The artistic work of Edith Breckwoldt will soon be displayed publicly in Lauenburg. Artist Barbara Haeger (1919 - 2004) enrolled in sculpture studies at the Kunstakademie in Frankfurt a.M., in Berlin and at the Landeskunstschule Hamburg under Edwin Scharff. Since 1953 she had received several commissions for works of art on buildings in Hamburg. 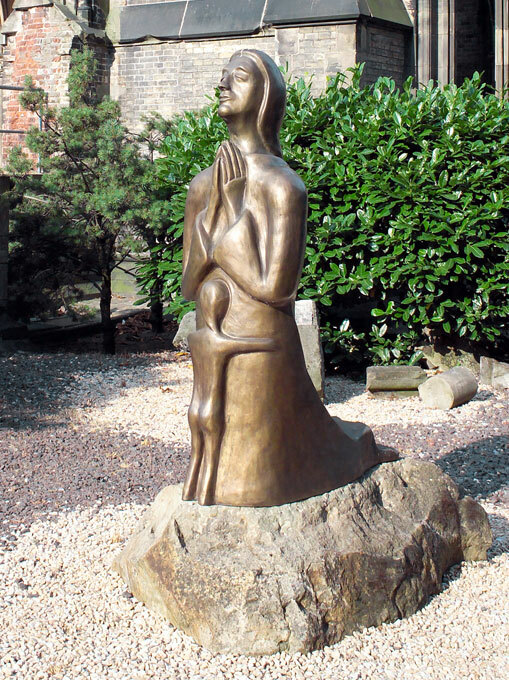 In 1960 she created the Female Angel, a representational sculpture, moulded and cast in bronce. The Landeskirche bought this sculpture for the Memorial in 1972. The sculpture is placed at Neue Burg immediately behind the apse between two pier buttresses. From January 2013 til spring 2014 an impressive art installation entitled ‘Right to the top…’ was mounted on the spire of St. Nikolai Memorial. 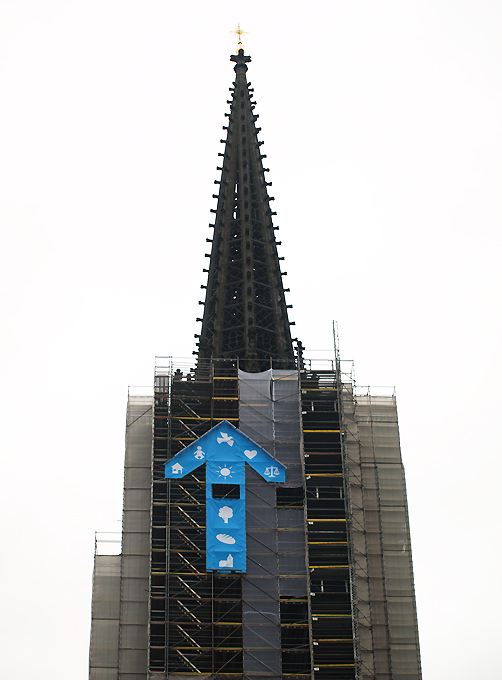 This work of art consisted of a blue arrow pointing straight up to the sky, bearing the icons of the Kirchentag campaign. The west façade of the spire which due to restoration work had been scaffolded could offer so-called Kunst am Bau (a work of art on a building). 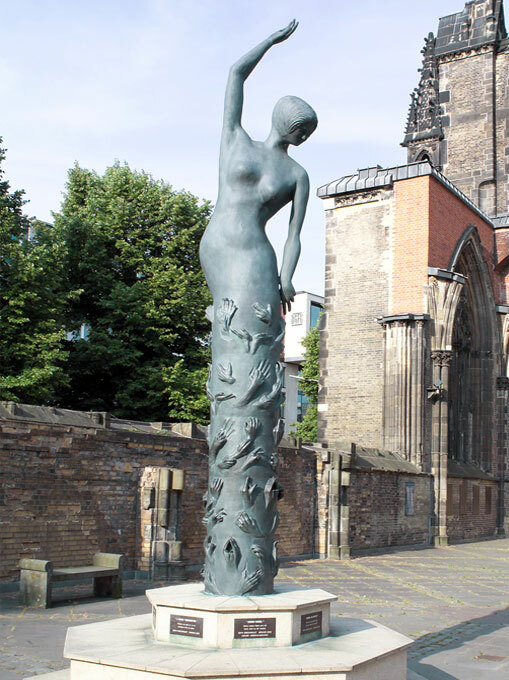 The arrow was jointly commissioned by St. Nikolai Memorial and the 34th German Protestant Kirchentag. The installation, 15 by 10 metres in size, was designed by Hamburg architect Mirja Grosskinsky. She explained, ‘‘Drawn in the cityscape, the arrow serves to point the way. By changing the scale it changes our ‘habits of seeing things’. In a very striking fashion it points us in the right direction and serves as a landmark. An allusion to – this is where we want to go … to the Kirchentag/up the spire."